New England Boatworks Inc. (NEB) is required by the Environmental Protection Agency (EPA) to record all use of paints, varnish, thinners, resins etc. This requirement is for all work performed at NEB, whether the work is performed by NEB, you the customer or anyone else. The enclosed form must be completed prior to launch by all customers, whether such work was undertaken by NEB, by yourself or by a sub-contractor, and even if no work was done. Please note that your boat will not be launched if we have not received this form either by hand delivery, mail or e-mail. If you wish we can e-mail you a copy of the form to sign off on. NEB strongly recommends that you consider using a low VOC product such as Pettit Hydrocoat Eco or SR, or Interlux CF. These products are compatible with most existing bottom paints and are multi-season paints . These products will be the paint of choice for all boats being painted by NEB unless we are specifically requested to use other, less eco friendly, products. 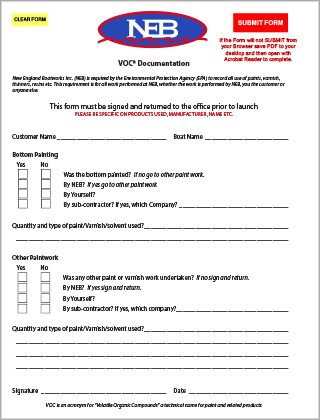 • If you did not paint the bottom or do any other paint/varnish work check the appropriate boxes, sign and return. • If NEB did the bottom or other paint/varnish work, check the appropriate boxes, sign and return. We already have records of what product was used. • If you did bottom or other paint/varnish work yourself, or had a sub-contractor do this work, please check the appropriate boxes. In this case we need you to fill out the specific brand, type and quantity of paints and/or solvents that were used, sign and return. Thank you for your co-operation in helping NEB to abide by the regulations that have been imposed, and wishing you all fair winds and following seas. Please complete the online PDF and click Submit to email to NEB. If you cannot send the PDF from your browser, please download to your desktop and complete from there. Thank you. VOC is an acronym for “Volatile Organic Compounds” a technical name for paint and related products.